Wayne Montecalvo is a multi-disciplinary artist who holds a Bachelor of Fine Arts degree from the School of Visual Arts. Born in Perth Amboy, New Jersey, he currently lives and works in Rosendale, New York. Recent solo exhibitions include TSL Warehouse in Hudson, NY (2017); The Hall of Awa,Tokushima, Japan (2016); and CHRCH Project Space, Cottekill, NY (2016). Recent group shows include, ‘Depth Perception’, co-curated by Joanne Mattera and Cherie Mittenthal, Cape Cod Museum of Art; ’The Invisible Wall’, Muroff Kotler Visual Arts Gallery, SUNY Ulster, Stone Ridge, NY; and ‘Minimal/ Maximal’ curated by Mike Carol, Truro Center for the Arts, Truro, MA (2015). 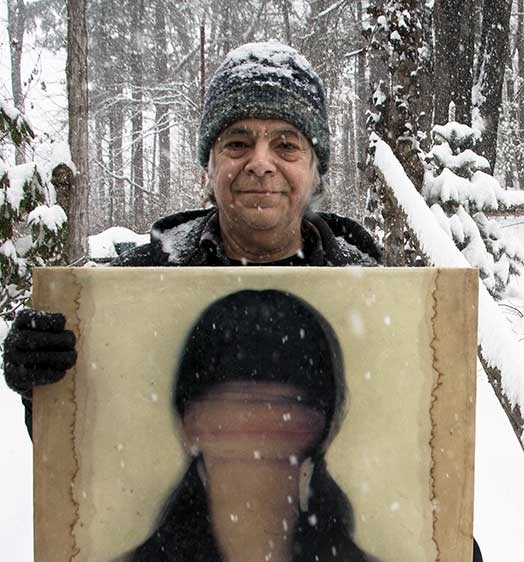 Wayne’s awards and honors include the 2016 Awagami Artist-in-Residence Program at Awagami Paper Factory in Tokushima, Japan; NYFA MARK ’09, a competitive statewide professional development program; Two Full Fellowship Awards for residencies at the Vermont Studio Center, Johnson, VT (2007 & 2005); Two Residencies at the Frans Masereel Centrum voor Grafiek, Kasterlee, Belgium (2000 & 2004); John Michael Kohler Foundation Arts/Industry Artist-in-Residence, Sheboygan, WI (2001); Women’s Studio Workshop Artists’ Fellowship (1998); and an Artists At Work: Community Projects Grant from the New York State Council on the Arts (1997).